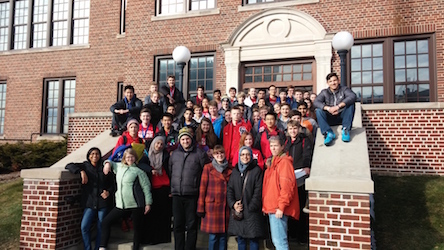 On Saturday, January 30, fifty US students represented Prairie at the Southeastern Wisconsin Regional Science Olympiad Competition. Thirteen teams competed for medals in 28 events as disparate as deciphering hidden messages, measuring the fat content of heavy cream, identifying fossil specimens, constructing a device to capture wind power and using a computer model to reduce anthropogenic effects on groundwater. Prairie participated in 26 of these events and came home with a whopping 24 medals including 14 first place finishes! Prairie’s success at the regional competition is a testament to the students and the hard work they spent preparing for their events. With rare exception, the contest topics do not align with typical topics taught in high school science courses. Prairie’s Science Olympiad team does not have regular meeting times; rather, students make time in their own schedules to prepare for the competition. They must locate their own resource materials, teach themselves the topic, prepare binders of reference materials, build and test devices, and/or conduct experiments. Coaches Hannah Lane, Arooj Mukarram, Matt Evans and Jean Weaver help the students when asked, but preparation is performed largely by the students. Highlights from the competition include freshman Frank Felerski’s performance in Game On. Given just 45 minutes, Frank used Scratch to write a computer artillery game centering on the theme “remote systems”. Working by himself against teams of two, Frank took second place. For the event It’s About Time, Maya Nepos and Kirat Kaur made a pendulum clock that was the most accurate time piece at the competition. With some precision help from physics teacher Arooj Mukarram, these junior girls were off by just 0.2 seconds when timing a period of 267.3 seconds!